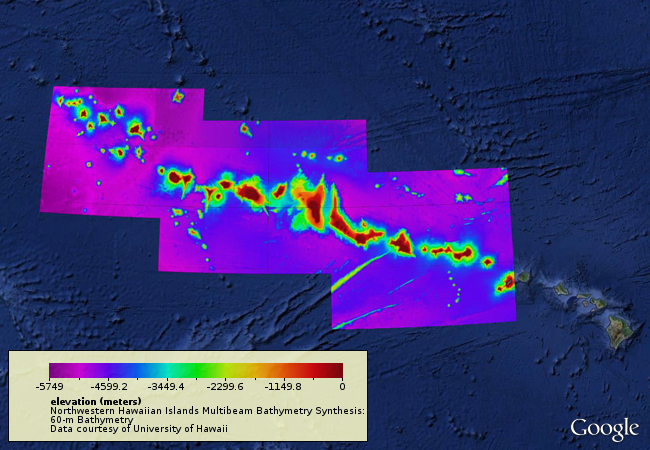 A 60-m resolution gridded synthesis of all available bathymetry (ocean depth) data for the Northwestern Hawaiian Islands (NWHI), including ship-borne multibeam sonar surveys merged with lower resolution (1-km) global bathymetry from SRTM30+. Because of its remote location, dedicated multibeam mapping of the NWHI region began only in the year 2000. In an effort to consolidate the more recent systematic surveys with older transit data swaths for this region, a synthesis of all existing multibeam data was undertaken beginning in 2009, with a fourth revision completed in mid 2015. Lineage Statement Version 4 of the synthesis released (06/24/2015).